A bit of ‘argy-bargy’ has broken out over the future of Sydney’s public transport, with Transport for NSW, Infrastructure NSW (INSW), and the City of Sydney council all proposing different ways to fix commuter woes. There are three major plans currently on the table to fix Sydney's transport problems: council’s Connecting our City transport strategy; Transport for NSW's Draft NSW Long Term Transport Master Plan; and INSW's First Things First - The State Infrastructure Strategy 2012-2032. From the three strategies a stark choice between bus and rail has emerged for the future of the city’s main artery, George Street. A council spokesperson says while council and Transport for NSW support light rail, INSW has recommended a bus-only tunnel. "There is a bit of argy-bargy going on there," she says. Council held a forum last night at Sydney Town Hall to lobby support for the light rail option, which it believes will improve the city centre while reducing congestion. "Council just think light rail is a better option with the reconfiguration of George Street," the spokesperson says. 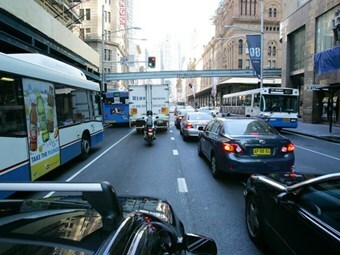 Further complicating the plot, BusNSW has expressed support for a Bus Rapid Transit (BRT) system in line with INSW's proposal. BusNSW Executive Director Darryl Mellish says mode selection should follow a functional analysis of what transport tasks are required on a corridor. it being preferred over trams and light rail," Mellish says. Mellish says investing in bus related infrastructure will generate the biggest community benefit over the next twenty years. He says BRT has lower capital cost than light rail, lower operating costs than light rail, is generally faster than light rail, is more flexible than light rail, can be phased in, and can act as an interim system. BusNSW has also expressed concern the introduction of light rail in George Street will force commuters to transfer from bus services. Council unanimously endorsed its transport blueprint on Monday night.